These adorable African Penguins Walking On The Beach - Wall Poster are an irresistable college graduation gift for any animal lover. 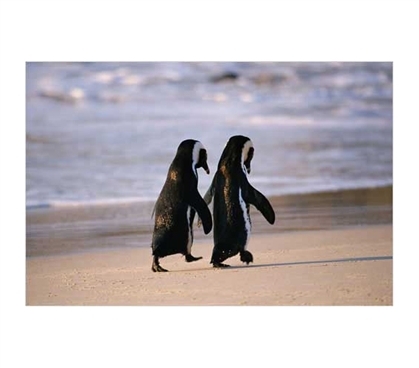 The romantic penguins are walking hand in hand on the beach. Maybe penguins are your favorite animal, maybe not, but either way they'll be cool stuff for college men and women. Strolling on the beach is something every college student should do, but sometimes you pass on it. Let these penguins remind you, take that stroll. Is your dorm room feeling cold and dreary? If you think so, maybe these warm loving penguins can be the college wall decorating essential you need to add vibrancy and life to your college room. Want to impress the girls you meet at college, then get this fun-loving animal poster and show your man-sensitive side! !